During a much anticipated sit-down with Birthday Girl Oprah Winfrey (Happy 59th Birthday Lady O!) 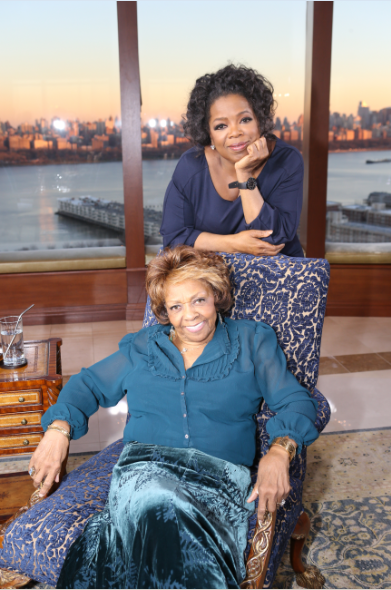 for her "Oprah's Next Chapter" series, Grammy-winning singer Cissy Houston provided a candid look into the life of her famous daughter Whitney "Nippy" Houston and expressed the grief she's felt since her daughter's passing. While promoting her new book, Remembering Whitney: My Story of Love, Loss and the Night the Music Stopped, Cissy was pretty open and honest with Oprah as she shared her thoughts and motherly observations about Whitney's life behind-the-scenes. And, of course, the addictions that finally consumed her. Oprah covered a range of topics, with many of them ripped straight from the tabloids. During one particularly tense exchange, Oprah addressed the gay rumors (regarding ber friendship with Robyn Crawford) that followed Whitey during the earlier part of her career. OW:"Would it have bothered you if your daughter, Whitney, was gay?" OW: "You would not have liked that?" CH:"Not at all," she responds. OW: "You wouldn't have condoned it?" That exchange led into Cissy's thoughts on Whitney's relationship with Bobby Brown. Though Whitney ended up in a heterosexual marriage, Cissy wasn't very pleased with her selection. When asked if she was happy about Bobby being in Whit's life, she simply said "No." Michael tearfully revealed that he blames himself for her downward spiral and he thinks about her everyday. Cissy Houston also spoke to Al Roker on the "Today" Show about her new book "Remembering Whitney." all that talent and all they wanna talk about is her drug addiction. shame. No one wanted to believe "America's Sweetheart" was into all this but I read the tell all book from 1995 that her bodyguard wrote. He was also screwing Whitney's publicist. He had info coming from every angle but people thought he was lying about how Whitney introduced Bobby to coke, all the stories about Whitney & Robyn's volatile lesbian relationship, how Robyn was insanely jealous of Bobby, about how both of Whitney's brothers were putting coke in their weed, her publicist having to come up with more creative lies on why Whit was missing so many concert dates because of being so hoarse due to all the weed smoking. The book was called Good Girl/Bad Girl. I am surprised he has not been interviewed cause all that stuff her wrote about is now coming out. He even wrote how the family were experts at selling photos to the National Enquire. He wrote that even though they had a deal with Ebony, Whit gave a few photos of her wedding to her publicist to sell & give the money to her dad. Her publicist got a good price, kept a few ends for herself and gave daddy Houston the rest. That is why I believe the fam sold the tabloids pics of Whit in her coffin. Well there you have it... Bobby Brown didn't introduce Whitney to drugs, I'm actually disappointed, because it's so easy to make him the bad guy. The fact that it was her own brother makes the situation sad and so much worse... Her own family contributed (however not solely) to her downfall. However, Bobby Brown definitely was not a good influence on her. I absolutely LOVED Cissy's responses and body language. Did you approve of her marriage to Bobby? "No." Do you think Bobby Brown is a good dad? *Blank stare* Mrs. Houston is something else! Now can they keep Bobby Brown out of their mouths. Sh*t, most mothers don't like who their sons and daughters choose. That was Whitney's choice and they did love each other, they both just need ed help. Everybody, except Cissy, knew Whitney was doing drugs before she met Bobby. They've dogged this man for years and he's said nothing, he just took it. Bobby isn't perfect, nobody is so leave him the eff alone!!! I rather listen to Cissy ALL DAY, than to hear the sh!t Pat Houston's OPPURTUNIST A$$ SPEWS! Sumthin ain't RIGHT with that woman! Idk, I think Whitney (like so many other celebs) had the wrong ppl in her circle! The ones that LOVED her left & the ones who were USING her stuck aroun for her demise! I'm sure Whitney was under a ton of pressure but she had so much talent, she really didn't know what to do with it. After she met Bobby, it was them AGAINST THEM WORLD, & she NEVER really moved passed that phase, even after their divorce! I'm sure Cissy is a hard woman to please but at least she keep sh!t 1hunna & I'm sure Whitney appreciated that! Bobby is probably on his 4th bottle of WHISKEY of the day right about now, I doubt an apology will make him no different! I enjoyed this interview, and really like Cissy. She definitely an old-school mama. I loved her bluntness and honesty. For Michael to come out and admit that he's the one who got Whitney started on drugs was very courageous. Now the truth is out. Sadly, he'll forever live with that. I thought Oprah did a great job interviewing Cissy Houston! Now that Whitney's brother has revealed something that he has been carrying around for most of his life (introducing his sister to drugs) maybe now he can get to healing and living. May God be with the Houston family. I wouldn't mind watching that interview.